We thought we’d start off our 2017 posts with a healthy, delicious, and fairly elegant salad meal, and one that is easy to prepare too. Though in truth, healthy, satisfying, and elegant meals are always easy to create when we eat the HumanaNatura way and follow HumanaNatura’s OurPlate healthy eating guidelines. In this case, our meal involves low-in-the-marine-food-chain shrimp, generous leafy greens and veggies, and vegetable fruits and berries – all among the healthiest foods we can consume. Our example HumanaNatura Salad Meal begins with a handful of medium-sized raw, deveined, and fully-shelled (tails-off) shrimp, which are tossed in a well-combined provençal marinade – comprised of two tablespoons of extra-virgin olive oil, one tablespoon of soft butter, black pepper, finely chopped garlic, a scattering of small capers, a squeeze of lemon juice, and about a tablespoon of finely chopped parsley. The marinated shrimp are allowed to sit, covered and refrigerated, for an hour or so. When the shrimp mixture is ready, we begin by steaming a root base of diced white sweet potato and onion or shallot, along with a bit of crushed and finely chopped garlic and a dash of cayenne pepper, for about two minutes (but with about half the water as usual – see our Cooking With Steam Overview for guidance if you are new to food steaming). Then, a small bed of finely shredded cabbage, the shrimp mixture, the liquid marinade (why less water is needed), and some coarsely-chopped baby broccoli are placed on top of the root vegetables. Everything is steamed for another three or four minutes, and then this warm part of the meal allowed to cool covered for a few minutes. As the cooked shrimp and vegetables cool, a salad base of mixed greens is placed on one side of a dinner plate. 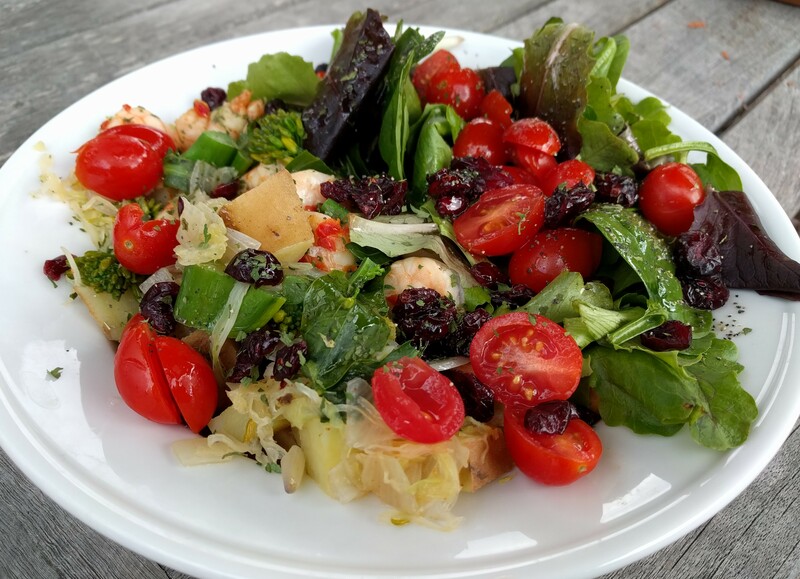 The cooked foods are then plated to the side of the greens, some halved grape tomatoes and dried berries are added, and the entire salad is dressed with olive oil and white balsamic vinegar, and garnished with parsley and black pepper. So simple, but an amazing and amazingly healthy meal too, and a great way to start the year. Enjoy! This entry was posted on January 14, 2017, 08:25 and is filed under Natural Eating. You can follow any responses to this entry through RSS 2.0. You can leave a response, or trackback from your own site.